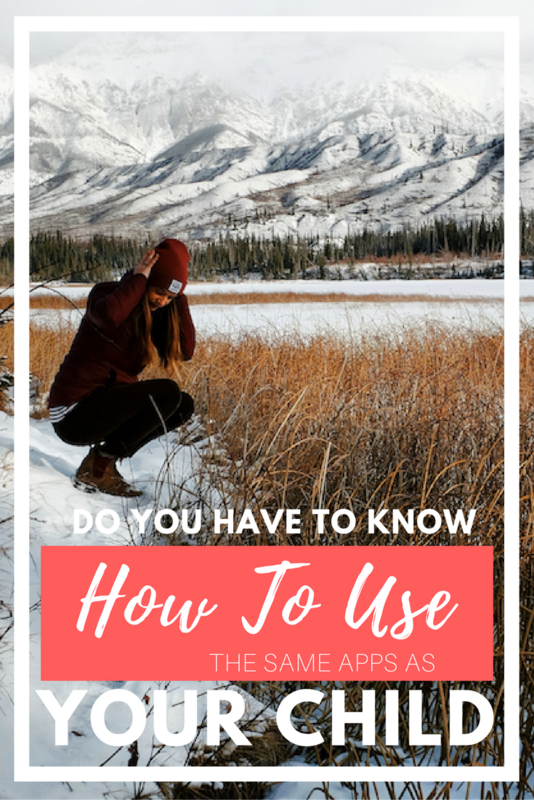 Do You Have To Know How To Use The Same Apps As Your Child? You’re probably making a mistake that’s going to cripple your ability to feel like your child can be safe online. Every time you dig deep into the nitty-gritty details of the latest app-of-choice for your child, you’re inviting hours of NON-PERMANENT work on your part. You know that, right? If you have not yet read Post #1 and Post #2, you NEED to do that first. Click here to read Post #1. At the end of that post, there's a link to Post #2, and — as you may have guessed, because coffeed-up you is ready to rumble — at the end of that post is a link that will bring you right back here. I know that you don't have time to click around on an Internet scavenger hunt so I promise that I laid this path out for you CLEARLY. So first, click here to download your checklist of 9 things you can start doing TODAY to help your child be safer online. And then, let's get this show on the road. If you’ve read my post on having the social media “talk” earlier than you might think, you know it’s important to prioritize having this talk BEFORE you’re having it in reaction to a cringe-worthy mistake your child has made. So if you’re like my standard reader, you’ll ditch the waiting until age 13 to start talking to your child about this topic, toss the “wait till 8th” idea out the window, and cut down your phone rules to only ones that you are truly willing to go to the wall for. But you’ve probably overlooked the one thing that’s even worse for your sanity and her safety, innocently thinking that it’s helping the both of you. It’s whichever little app you’ve been convinced — by your Facebook feed or the pick up line moms — is not to be used NO MATTER WHAT — because it’s the bad app in town. What’s wrong with this, you ask? You can’t control what apps your child uses on unmonitored devices. You can’t control how long your child’s group of friends will stay into that app. And you can’t control how your child will use the app the mom next door deemed safe. Mind this part, it's important. You might sit down and declare NO SNAPCHAT because DISAPPEARING VIDEOS … and then Instagram will roll out the exact same feature. News flash: they already did this. Or you may say that ROBLOX is a fab app for your child's creativity … but then it’ll be all up in the news because people sent sexually explicit private messages to children via it. Talk about scary. Also: This, too, has already happened. And you may very well spend hours learning and discussing the ins and outs of the latest group video chat app that your child asked for … only to have her bestie get a new phone that only cooperates with a DIFFERENT group video chat app. Hand-on-heart: This JUST HAPPENED at my house. Forget all the hype about “Which apps are safe and which apps aren’t?” and think about this: If you teach your child the underlying skills she needs to have to make good choices online, these skills will carry over from app to app. Your child doesn’t have to be a magical tween unicorn and only want to use one app for forever and ever. If she happens to ask for a new app, the skills you taught her on the first app will be with her. Get those good app and bad app lists off your mind and give your child what she really needs: carryover skills. And learning about the apps themselves? Don’t ditch that altogether — but if you know what your child needs to know, then teach her THOSE skills through the first app that you learn together or texting. That way you’ll know that every time an app changes, she wants to use a new app, or your life gets busy and your monitoring gets spotty, she already has the skills she needs. Get rid of your good app and bad app lists. If you’re not comfortable with making that move permanently, then at least drag them to the end of your Notes list on your phone, put them away in a folder on your desktop instead of a ready-to-click-open Word document, or keep a Private Pinterest board with those articles in a safe, put away spot. I, too, have been a card-carrying member of that "Before" list up there and I know that it's not easy. And while the time and arguing and stress you'll save by switching from an app-based approach to a skills-based one sound ... well, delightful. Kids who are only taught app-specific rules are vulnerable. And kids who are taught to make smart choices ANYWHERE and ANYTIME online are not. I want THAT for your child. With no end in sight if you choose an app-based approach OR for a short period of time while your child learns the skills that she needs to to make her own safe choices online if you choose a skills-based approach. The beauty of this is that YOU get to decide, because YOU'RE the parent. This is, technically, the last post in your "Bad App Chase Series." But I do have just one more post for you today; a bonus if you will. Click here to see this whole series wrapped up in a tidy, 'lil bow. If you've never thought about ditching the app chase before, I’m sure you have an opinion here — and I’d love to hear it. Sign up here and reply to the email I send you to tell me whether you’re going to change anything with your child and her apps — and why.